5. Also, with CTRL+SHIFT+RIGHT-CLICK (mouse) we can still have local compilation, color schema and JarClassTest options as shown in below snap shot. Note: The above procedure is not recommended for production PI systems. Really nice blog,i was disappointed after sap disabled the hidden menu of PI mapping. Now I can able to export the mappings with this procedure. Super like! Thanks for the blog. Thanks Sunil and Dinesh for your comments. Good Going , Keep it up and provide us more of this kind!! I used short cut CTRL + SHIFT + 0 with German keyboard, not CTRL+SHIFT+ ALT 0. Maybe it is because of different keyboard layout. I can export my MM with Ctrl+Shift+0 without the trick , as exported 7.1. I have PI 7.3 , I just see the XIM file on my PC. Below you can see the details PI 7.3 and I can see the import button for exporting. import button for importing XIM files for your p 7.3i version with Ctrl+Shift+0″ exists/enabled by default? We are on PI 7.31 SP 10,i have tried all the steps suggested by you to download the mappings,have copied the jars from PI 7.1 to PI 7.31 folder and modified the batch file and was able to launch ESR with the batch file start.bat,but after opening my message mapping when i try pressing Ctrl+****+Alt+0 no action.I have tried even Ctrl+Shift+0 as well and also tried O instead in 0 for both the combinations,any clues why i am not able to download the mappings with the trick given by you. can you make sure, that the short cut is not used by any other program and then test it again? Is there a trick to making it work in PI 7.11, please? Thanks for the content. It was very helpful. Does anyone know how we could retrieve this single jar file? Maybe somebody could send it to me? I have followed your both the blogs and all steps I have performed but still CTRL+SHIFT+ALT 0 or CTRL + SHIFT + 0 is not working for me. Can you please help me here to identify missing step? What is your PI/PO version? Single stack? and service pack? I have followed your blogs and all steps. start.bat gives below error in the screenshot . Can you please help if need to do any additional settings for PO 7.5? Have your batch file into your TempIbJars folder and also copy javaws.jar file into this folder. Thanks for quick help. After I edit the start.bat file webstart worked fine and I am facing below error now. Attaching the log. Did I miss any jar file? Thanks for catching the issue quickly. 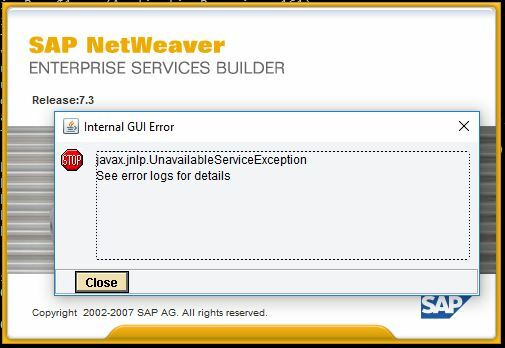 After placing the javaws.jar (following steps 7&8) I am able to get login screen. Once I enter user & pwd I am getting below error. Please share the fix, If you see this error before.